Since August 2012, I’ve been the producer of It’s All Journalism, a weekly podcast focusing on the every changing digital media world. I’ve had the pleasure of interviewing more than 250 smart journalists about the way they do their jobs. I’m also the senior digital editor at Federal News Radio, where I oversee the digital team and our online content. Since August 2012, I’ve been the producer of It’s All Journalism, a weekly podcast focusing on the every changing digital media world. I’ve had the pleasure of interviewing more than 250 smart journalists about the way they do their jobs. The great thing about launching your own podcast is that you get good at all aspects of it, from generating story ideas and tracking down guests, to recording and editing interviews, from posting audio online and building a website, to marketing the show and engaging with your audience. It’s an endless cycle of production that I have a blast working on. Thanks to the podcast, I’ve had the opportunity to give “how to podcast” presentations at the Online News Association and Association of Alternative Newsmedia’s annual conferences and the DC Podfest and Mid-Atlantic Podcast festivals. I’ve also written about podcasting on the It’s All Journalism [ItsAllJournalism.com] website and mentored fellow podcasters at Federal News Radio and WTOP. In addition, I’m working with the National Governors Association to launch a podcast about cybersecurity. In November 2017, I will be teaching podcasting as part of the Masters in Journalism and Digital Storytelling program at the American University School of Communications. The podcast also got me a book deal. 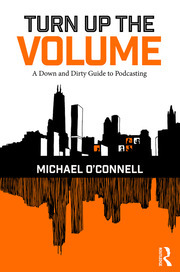 In July, Taylor & Francis will be publishing my textbook, Turn Up the Volume: A Down and Dirty Guide to Launching a Podcast. Although I’m a journalist with more than 30 years of experience, this is the first book I’ve ever written. The book is based on conversations I had with more than 50 podcast creators. This experience provided me with invaluable insight into what makes a great-sounding and engaging podcast. I've been married to my wonder wife Fran since 1983. We live in Fairfax, Virginia, a suburb of Washington, D.C., with my two daughters, Kayleigh and Amber, and a half dozen cats. My oldest son, Chris, lives nearby. B.A. in Journalism/English, Indiana University, 1983. I'm a journalist with more than 35 years experience in newspaper, magazine and online media. As the senior digital editor at Federal News Radio, I'm proficient in writing, editing, interviewing, photography, story development, team leading, planning, audio and video production, webpage design, graphic design, social media, marketing and data analytics. Since 2012, I've been one of the producers of the It's All Journalism podcast. Not only did I help launch the podcast and its corresponding website, each week, I interview media professionals about industry trends and the work they do. I've had a life-long interest in science fiction, comic books, film and pop culture, which resulted in many memorable interviews over the years with artists, writers and other creative people. I love going to baseball games with my son Chris (Go Nats!) and collecting original artwork by Milton Caniff, the creator of the Terry and the Pirates and Steve Canyon comic strips. I like shooting pool with my wife Fran and spending time with my daughters, Amber and Kayleigh.